We sit in Sovok, the café all of the adolescents of Nizhny Novgorod frequent. I sit across from her, my fair redhead Masha, my language partner. She giggles at my excitement over the lapsha, the smell of the sweet and spicy noodles tickles my nose and activates my salivary glands. Hand-drawn pictures hang on the wall behind Masha, right above the mirror that reflects my happy smile. Some of them smile back at me. Na zdorov’ye, Masha says to me. Yes, this is our favorite place. Jazz music floats hauntingly through the café, engulfing us in its soft melodies. I watch Masha dig into her box of lapsha. The lively saxophone hums and buzzes slowly along with the soft bum-da-da of the drums in the background. Then I hear his voice. It is just as enthralling and pained as the first time I heard it. The words sting. I look at Masha, hot tears welling up in my eyes. She looks back at me curiously. What is he saying? I stumble over the words, because I don’t know how to translate it. So I describe it — the feeling behind it, the meaning of it. He is singing about the sadness he feels from being a black man in America. I look around. I am the only black person in the café. I see the curious stares — some give me quick glances from across the room. Others sit silently, sleepily waiting for their meals. I look back at her. She tells me not to be sad. She loves me. She wants me to know that. She wants me to know that she considers me just as Russian as she is. She is so happy that she met me, a true American. I house so many different identities and cultures within myself. I can call so many places home — Russia, America, Ghana, Armenia. She tells me that she wishes the African Americans were treated better. I sigh. 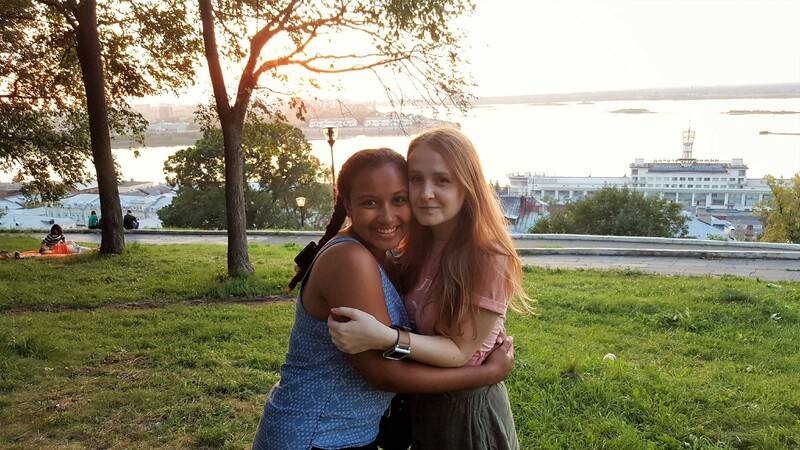 Masha, I have never been able to express how I feel about being black and white and blue in Russian until I met you. You force me to express it in a language that is both my very own and yet so foreign to me. You ask me your questions, always showing genuine interest in my well-being. How could I otherwise learn to express Fats Waller’s poetry in Russian? The tears disappear and a smile creeps over my lips. Thank you for allowing me to share my story in a new way. 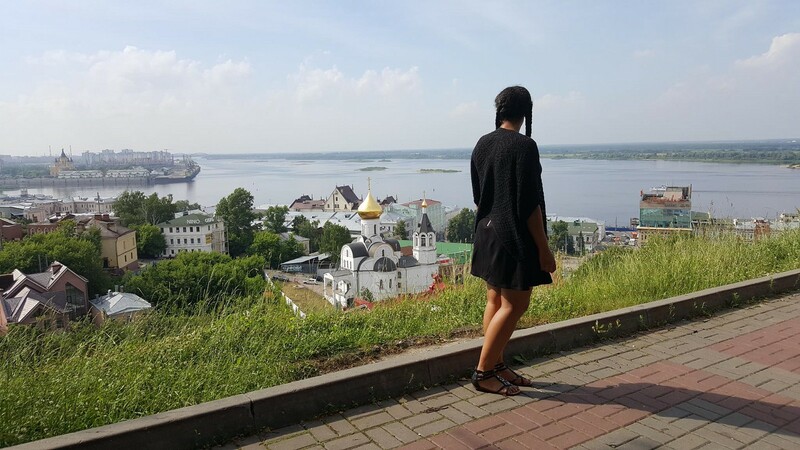 I wanted to study abroad for language acquisition and self-exploration. But I realize I’ve gained so much more. I gained a friend and a confidante. I know how to tell you why I feel black and blue, and I smile a little when you tell me that you don’t understand my position, but you care enough to listen. You hold my hand and blow me a kiss.